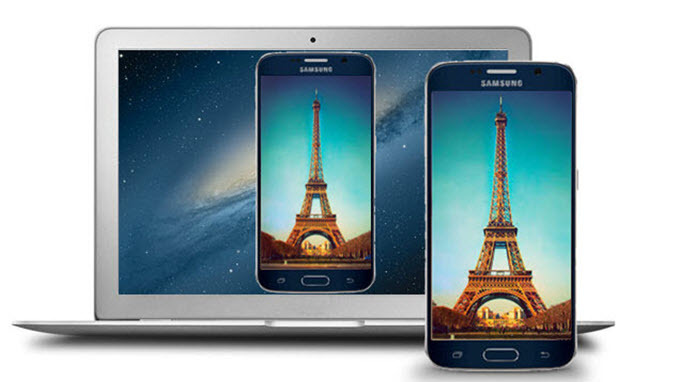 There are many situations where you need to display Android screen on PC in the daily life. For example, you may want to show your cherished photos or videos to your friends without uploading to PC. Or you may present your PowerPoint content quickly to others on your PC without transferring to the computer. What would you do in such situations? It is easy to solve them if you take patience in reading the following content. 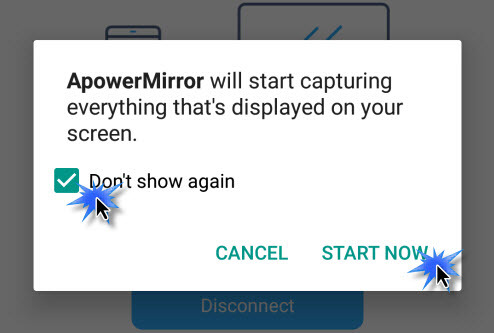 With ApowerMirror, users will feel free to project Android screen to the computer and control Android from PC. By following a few easy steps, users can achieve many things with this application. While displaying Android on PC, you are allowed to use mouse and keyboard for typing messages and playing games. During the process, users can record the screen or take a screenshot and the files will be saved to the local folder. Install the program on PC and activate it. Plug in the USB cable to build the connection between Android and PC. The app will be automatically installed on Android after your permission. When launched, a window is shown on your phone. Select “Don’t show again” and hit “START NOW”. Now phone screen is cast on PC. Meantime, you can take advantage of keyboard and mouse to control mobile device from PC. It’s feasible to display phone screen on PC via WiFi connection, but both devices should be connected to the same WiFi. MirrorOp Sender is an app that you can use to show your Android smartphone on your Windows screen, but it also requires installing a MirrorOp Receiver on your computer at the same time. MirrorOp Sender displays Android screen on PC with the assistance of MirrorOp Receiver. However, while using this tool, you must ensure your Android device is rooted and your mobile and PC are under the same WiFi network. Download the MirrorOp Sender on your Android device. And install the Windows version of Receiver on your PC. Open the Sender application from your mobile and launch the Receiver application from your PC. Your phone will automatically search the Receiver on the computer and you can begin to mirror the screen of your handset to the computer. MirrorOp Sender is a possible alternative to help you display Android phone screen on PC, but it requires Root access before it starts to function. However, most of us have little knowledge of Rooting and those who know about Rooting would rather not do it for its potential risks. Luckily there are applications which do not ask for Rooting but work more efficiently. The tool below is such a top option among the all. AirMore is a comprehensive web-based app which empowers you to make overall management of your Android phones. One dramatic feature that makes it stand out of other apps is its “Reflector” function. Users can take full advantage of it to display the Android content on Windows or Mac screen even without using USB cable. Click the download button below to download this tool for your Android mobile. Or you can head over to Google Play Store to download it. Browse through AirMore website on Google Chrome, Firefox or Safari. Click “Launch AirMore Web to Connect on the PC web to scan the QR code or click the device icon in Radar with your handset. Please set your phone and PC under the same Wi-Fi network in order to activate connection. Once connected, tap on “Reflector” icon on the web. 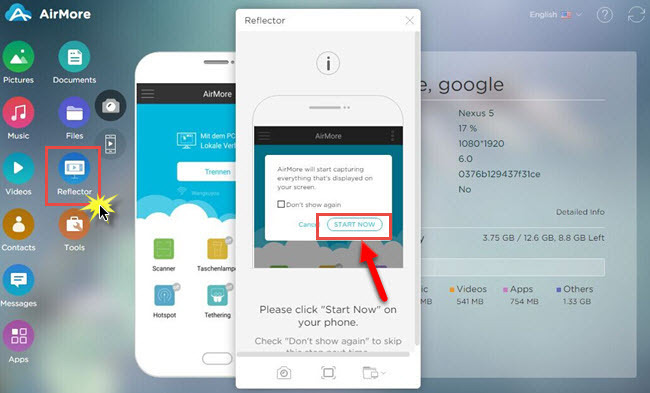 When a prompt box pops up on your smartphone and PC screen respectively, click “START NOW” on your Android. Simultaneously, this tool will start to display Android screen on PC in real time. Without taking risk of rooting your mobile, this app allows you to quickly play Android games on PC or mirror any content on your Android to a bigger screen. As a versatile app, it is also able to transfer files between your phone and PC, delete useless files or play media files on the PC screen. 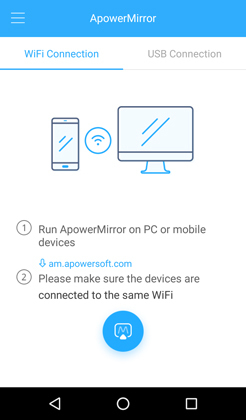 Comparing to MirrorOp Sender, ApowerMirror and AirMore is much better, because it is easier to operate and more independent. As long as your Android is running 5.0 or higher, you can view Android screen on PC. Besides, the output video quality and smoothness on bigger screens are almost the same as that on the phones. Hi, is it possible to have the phone's display show on the pc if my phone's screen is broken (black) hence I can't accept or install anything on the phone the prior to having the display on the pc. Dear Joao, it only possible to connect successfully if you had it connected before. Otherwise, you cannot display it on PC under this circumstance. And if you have further questions, please be free to contact us! Thank you for your support! To be sincere, I got this info helpful. am glad using Airmore! I think apower is better than airmore for showing what's happening on the phone screen, as the resolution is much better than the airmore one but neither perfect. Not looking for any other function. hello, is there any way to connect and use phone when wifi network is not available? Hi, the ApowerMirror program mentioned in this article can help you. It allows you to connect via USB cable, which doesn't require the WiFi network. Thank you! Hi, have you given AirMore the permission to pop out windows? You can go to Settings to check it. If you have done that but still cannot see the window, please slide to the right side and send feedback along with log file to us. We will check it for you. Thank you!